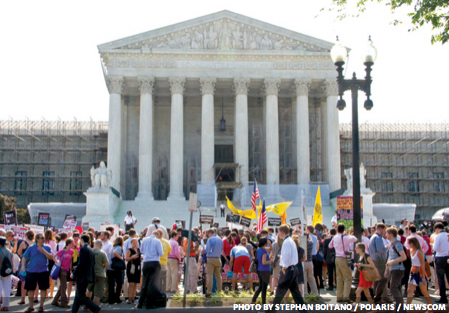 Supreme Court’s Health-Care Ruling Could Weaken Charity Tax Breaks. Christianity Today September print issue. The U.S. Supreme Court’s ruling upholding the Affordable Care Act—or “Obamacare,” as some have dubbed it—has advocates of faith-based nonprofits concerned about potential unintended “collateral damage” to their bottom lines. The worry: Chief Justice John Roberts’s nod to lawmakers’ wide discretion to impose taxes—and to condition taxes to influence behavior—could pose threats both to charities’ tax exemptions and to donors’ tax deductions. “It’s an issue that’s definitely on our radar,” said Rhett Butler, government liaison for the Association of Gospel Rescue Missions. Stanley Carlson-Thies, president of the Institutional Religious Freedom Alliance, said he’d be surprised if the health-care decision doesn’t spark “new activism” on the tax front.